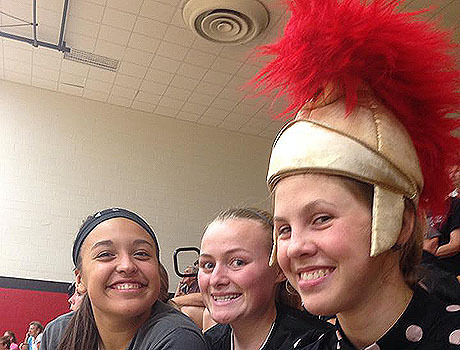 Kristina (right) sports the school mascot Trojan hat with friends Sarah (left) and Angela (center). Before I got here, I was disappointed, because I knew I was going to a rural area. I thought my dream year in U.S. would be boring— no cinema, no malls, almost nothing...except for school. But I was wrong. I love American school! It’s the place where students spend most of their time, and it is much more fun than Ukrainian school. So many clubs and sport activities are available—art club, drama, golf, soccer, football, volleyball, softball, pool, basketball. And I really advise every exchange student to join one of them. It’s a good opportunity to reach out to people, make new friends, feel the spirit of teamwork, and become a part of the community. I decided to play volleyball. We have practices every day and competitions every week. We support each other during the game and live every moment together. It brings us together! Your year in America depends on you! So reach out to people, participate, make friends, and have fun!